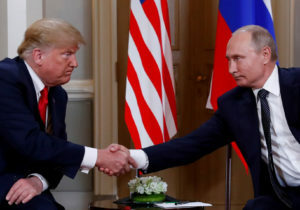 WASHINGTON — Donald Trump and Vladimir Putin may have reached several historic agreements at their summit in Finland this week. Or, they may not have. It depends on who you talk to. Three days later no one was quite sure. For now, everyone but Trump and Putin and perhaps a handful of their close confidants are in the dark. Director of National Intelligence Dan Coats, speaking at the Aspen Security Forum on Thursday, said that he wishes President Donald Trump hadn’t met alone with Russian President Vladimir Putin at a summit in Finland. Associated Press writer Deb Riechmann in Aspen, Colorado, contributed to this report.